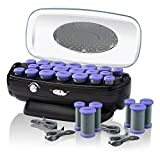 What are good hot rollers for thick hair? Do hot rollers damaging your hair? Are hot rollers easy to use? How do hot rollers give volume? How long to leave in your hair? How to make curls last? Why are my hot rollers not working? Can I use my hot rollers on damp hair? Hot rollers vs. curling iron – Which do more damage? Many women are discovering the secret to achieving salon-quality hair at home! With the right products and styling tools, you can get the beautiful bouncy hair that you’ve always dreamed about. It won’t cost you hundreds of dollars, just a set of the right hot rollers. Several women shy away from using rollers of any kind because they think that they won’t get the right look with them. But you’re in luck! No matter what kind of hair you have, with the right hot rollers, anything is possible. The key to getting your dream hair is using the right tools that have a proven track record. The following hot rollers are some of the best on the market today. The Caruso Molecular Steam Hairsetter works well with all types of hair. When using the hairsetter you can create strong and beautiful curls with great shine and body. With this roller set, women with thick hair everywhere can breeze through the curling process with rollers that heat up in just 30 seconds. Perfect spiral curls can be achieved with the Caruso rollers. Unlike the short–lived curls you get from most roller sets, the curls created with the Caruso Molecular Steam Hairsetter last for days. 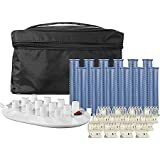 This set comes with comb clips, 6 large rollers, 6 medium rollers, 6 small rollers and a small carrying case. The steaming feature in this roller set conditions the hair as it curls. The Caruso Hairsetter works wonders with long hair, no matter the texture. Just over 2 pounds, these rollers are easy to travel with. The only setback about this type or roller set is that the hair should be completely dry before using it. Achieves the 30 second curl by blow drying hair first to evaporate moisture. Provides complete versatility for creating any of today's hair styles. The Infiniti Pro hot rollers by Conair offers argan oil infusion and helps to condition thicker hair while diminishing the amount of frizz in the style. The instant heat feature allows the rollers to heat up in 2 minutes and gives the user 12 temperature settings to choose from as well as varying roller sizes. The biggest benefit that the Infiniti Pro offers is its gentle touch with thicker hair textures.The Infiniti is designed to protect hair, unlike other metal roller sets that can fry the hair and make styles too stiff and dry. The Infiniti Pro rollers have many fans, but a few users have complained of issues with the plastic clips leaving a mark in the hair as well as the rollers being difficult to handle. Additionally, these hot rollers are a bit heavier than other roller sets. 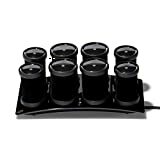 Featuring 12 rollers as well as a charging base to fully heat the rollers in just under 3 minutes and can be purchased in both short and longer sizes. The Calista Long Style Set is great for on-the-go styling. It is easy to travel with and lightweight enough to bring wherever you travel to. For the women with shorter hairstyles that complain that hot rollers are never small enough for their hair—this brand is for you! Calista hot rollers work well with a variety of hair types, including short, course, layered, etc. However, if you have very long hair, a few dissatisfied users have recommended choosing a different brand. The BaBylissPro Hairsetter features far-infrared heat technology that is designed to eliminate any hotspots throughout the rollers, keeping your hair heat-damage free. This set comes with 20 rollers made of titanium ceramic that gently roll the hair into beautiful curls. The rollers’ dual ionic ports reduce frizz through the emission of ions. BaBylissPro has a lot of fans and is often hailed as one of the best hot rollers for thick hair, and we can see why. 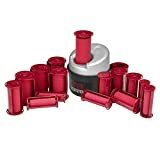 These rollers are great for keeping the curl all day long and are also equipped with a handy on/off button. The varying sized rollers will give your hair great volume. However, a few reviews have reported that these rollers can overheat and, in some instances, have even melted. Additionally, this hair setter is a little bit on the heavier side, which makes traveling with them a bit of a challenge. The T3 Micro Voluminous roller set offers users great body, sensational shine and a lot of volume! The rollers themselves are powered with a t3 heat core, featuring two heat settings in order to provide the optimum amount of heat transfer for long lasting curls. The rollers are equipped with cool grip siding and have velvet flocking to make easy work of the styling process. All 8 T3 rollers come with clips that promise to leave your hair crease-free while comfortably and tightly holding your hair in place. These rollers are one size fits all, but aren’t heavy at all and have a beautiful case that makes travel and storage quite easy. Many users love these rollers but some have noted it is a bit difficult to remove the rollers from the base. Additionally, women seeking very tightly wound curls complain that the T3 roller set gives a looser wave to the hair. The best rollers for thicker hair are the larger ones. Having jumbo rollers will help the hair dry faster. The Infiniti Pro by Conair Instant Heat Ceramic Flocked Roller works well with thick hair because of its infusion with Argon oil as this makes thicker hair easier to manage. Hot rollers only damage your hair if the heat is too hot for your hair to handle. It is always recommended to use a heat protectant when using heat tools of any kind. This will help prevent your hair from suffering heat damage. Depending on the type of hair that you have, heat rollers should not be difficult to use at all. The best type of heat roller will let you control the heat setting and will be cool at the ends when you are putting them in your hair. Hot rollers give volume the way regular rollers do, just with the added heat to make the curls last longer. Instead of drying your hair with plastic rollers under a hooded dryer, hot rollers bring the heat to help mold your hair to beautiful curls. Depending on the heat setting and brand that you use you can leave in for as short as 2 minutes or as long as an hour. Make curls last longer by prepping your hair with mousse or leave-in conditioner. As sleeping on heat rollers may not be comfortable, curl your hair right when you get out of the shower. Hot rollers may stop working if they are worn out or if there is a short in the heating system. If they are not heating up at all, you may need to replace them. Yes. When the hair is wet, this is the best time to use hot rollers. Curling irons do more damage than hot rollers as hot rollers themselves are more controlled when it comes to heat. Particularly the rollers with the sensors that stop heating when the hair is dry. Hot rollers should always be handled carefully to avoid snagging the hair on any part of the roller. Curl and wave your hair to perfection with the Best Hot Rollers for Thick Hair. We rank the top 5 Hot Rollers especially designed for thicker hair.